Chapter 5559 sponsored by Uke's Harley-Davidson Inc.
Our Chapter plans numerous group rides and activities every week throughout the riding season, but we have eight that are designated as main Chapter Events. You can earn a Chapter Event Pin for attending at least half of the monthly meetings and half of the Chapter Events listed below. If you’re new to Kenosha HOG, you will want to read about each of these events and mark your calendars so you don’t miss them! Exact dates and times may change so check the Calendar and watch your HOG Breath Newsletters for updates on all the rides, meetings and other chapter activities. What are you doing on New Years Day? How about jumping into Lake Michigan? Better yet, how about watching a group of other people jump in Lake Michigan? It is really something to see when they push the blocks of floating ice aside to make enough room for about 100 wild and crazy individuals to frolic in the lake. Every year we kick off our riding season (some riding their motorcycles, but most riding in their warm cars) with the annual Polar Bear Ride. Bundle up and join us for some fresh air and watch the spectacle. We meet at 10 am at Uke’s and afterwards head over to a local restaurant for a warm breakfast with friends. March is still pretty cold for riding, but who doesn’t love a great bowl of chili to keep warm? Put your cooking skills up against fellow HOG members by entering our Chili Cook Off contest. Just fire up your crock pot and show us what you got! Or, If you’re a better taster than cook, just hang around after the March meeting to enjoy everybody else’s chili skills and help judge the contest. The March Meeting and Chili Cook Off are held at Uke’s. The Break Out Ride is our first real group ride of the season, so everybody polishes up their bikes (ok maybe not everybody) and joins their biker buddies for a great ride. There is nothing like breaking out on your first ride of the season and taking it all in. The Road Captains put together a nice route to help hone up on our skills, so make sure you plan on joining us! Our memorial ride is an annual overnight Memorial Ride that takes place the weekend after Mother’s Day. We choose a location that is far enough to warrant an overnight stay, but close enough if someone wants to ride home the same day it is doable. The purpose of this ride is to gather and remember past members that have passed away. This tradition started with Ron Young many years ago. Ron was killed by a drunk driver shortly after leading this ride on his way to Uke’s to pick up his new bike. Those members who were with him on that first ride, decided to make it an annual event, to pay a tribute to Ron and all the members who have passed on since. You will meet many members on this ride and have plenty of time to either relax and visit with friends, or get to know new ones. Sunday morning you can take any route home that you wish, but many of us meet for breakfast before heading out. Keith and Nanc have hosted an open house at Uke’s Harley Davidson during the first weekend in June for many years. Now they have added a September open house as well. Members are encouraged to join in the festivities such as food, entertainment, demo rides, and of course great deals on new and used bikes, clothing and accessories. The demo bikes generally make an appearance at the open houses. In July, our meeting is held outside and we have a good old fashioned family picnic. One of the Road Captains will lead a ride over while volunteers start setting up and cooking a huge feast. This is an event for the whole family, so bring the kids and be prepared to have some fun! This ride takes us on some of the most scenic country roads in Southeast Wisconsin, when the trees are at peak color. After taking in the beautiful scenery, we end up at a local Apple Orchard just in time to enjoy a great lunch grilled to perfection by our director and his grilling team. After lunch, we tally up the stops from the Stamp Books that have been turned in, and draw the winning books to award the prizes. We hope to see you during these Chapter Events, and don’t forget to sign in at each meeting so you can earn your Chapter Event Pin. 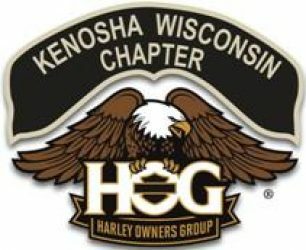 Welcome to the home of the Kenosha HOG Chapter. Sponsored by Uke’s Harley-Davidson, Inc.